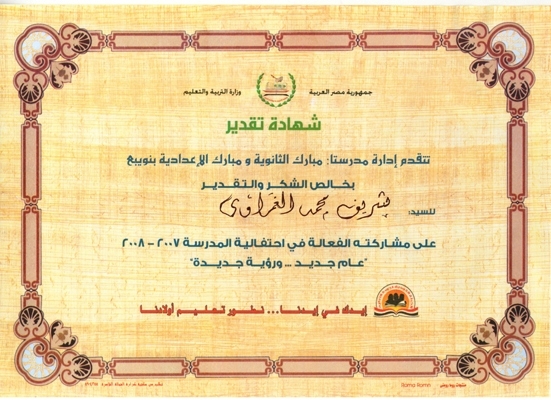 The Governorate of South Sinai awards Hemaya Association for being selected as the best Civil Society Organization functioning in South Sinai for the Year 2007/2008. 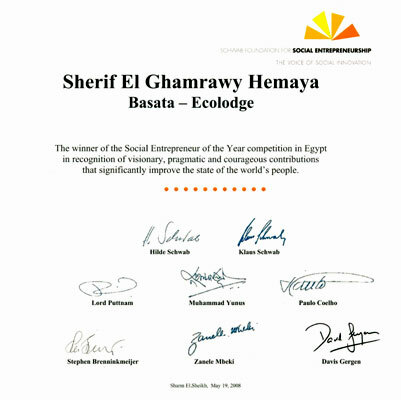 El-Ghamrawy as the Social Entrepreneur of the Year 2008. 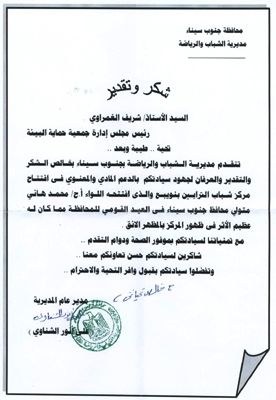 The department of Youth and Sports in South Sinai presented an appreciation letter to Sherif El-Ghamrawy, on behalf of Hemaya Organization, for its moral and financial support for the inauguration of Tarabin’s Youth Social Center/club in Nuweiba. 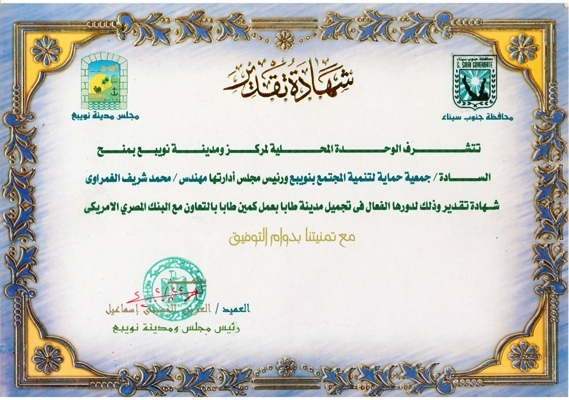 The Department of Social Solidarity (Social Affairs Section), Southern Sinai governorate recognizes Hemaya’s efforts in Honoring Mothers and fathers, also its efforts to celebrate the Orphan’s Day, besides its role in awarding academically distinguished students in Nuweiba. 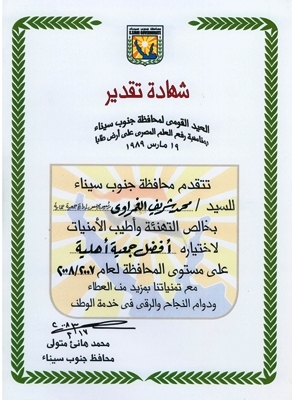 The Department of Social Solidarity (Social Affairs Section), Southern Sinai governorate recognizes Hemaya’s efforts in training a number of street Children to get engaged with Solid Waste Management and recycling techniques. 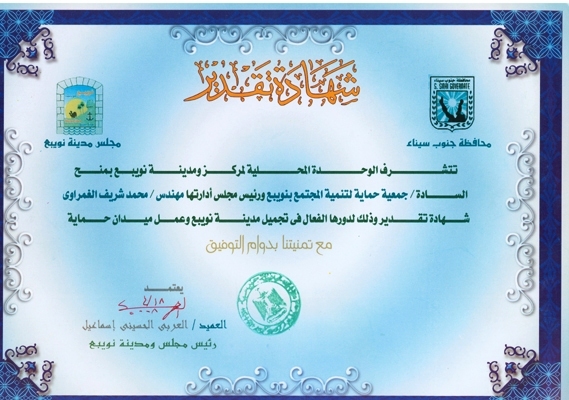 The Department of Education in Southern Sinai recognizes Hemaya’s efforts in renovating the buildings of the Elementary Schools in Nuweiba. 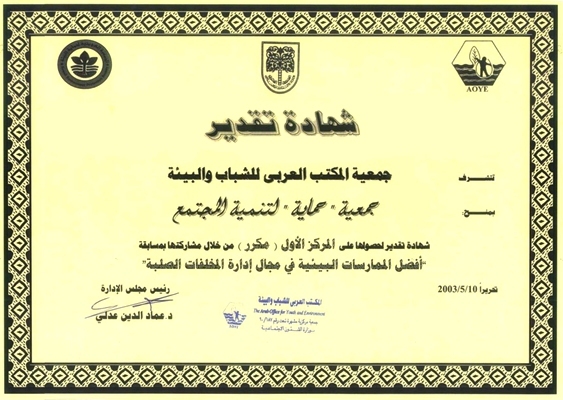 The Department of Education in Southern Sinai recognizes Hemaya’s efforts in providing Train of the Trainers’ courses to improve the quality of Elementary Schools’ teachers. 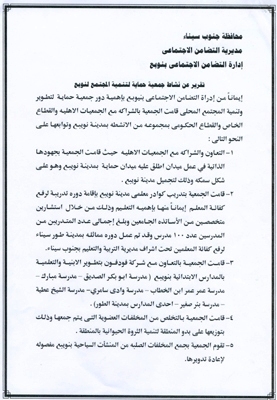 In 2008, recognizing Hemaya’s efforts in the region, the Department of Social Solidarity, South Sinai governorate issued a report listing the different social activities Hemaya performed. 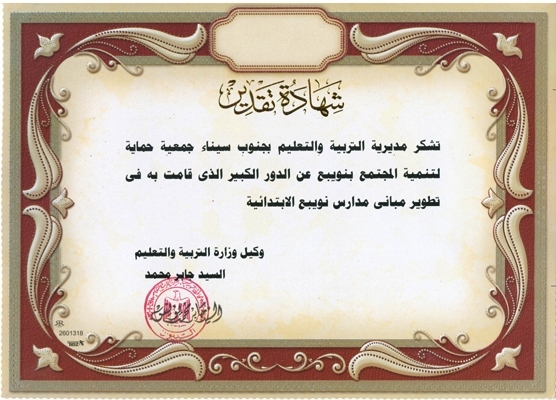 The local Unit of Nweuiba’s City recognizes Hemaya’s efforts in renovating and beautifying Nweuiba’s City, along with constructing Hemaya’s square in Nuweiba. 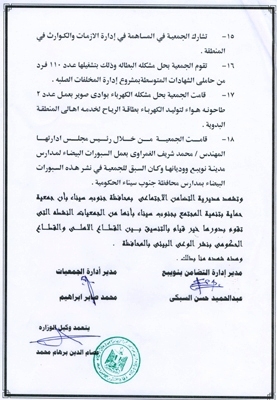 The local Unit of Nuweiba’s City recognizes Hemaya’s efforts in renovating and beautifying Taba’s City by setting Taba’s Security Checkpoint in cooperation with the American Egyptian Bank. 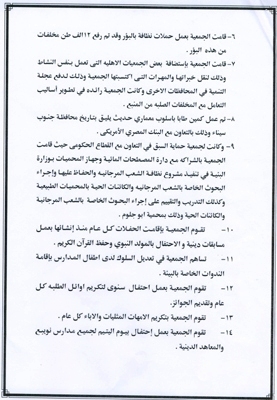 under the slogan “New Year: New Vision”.